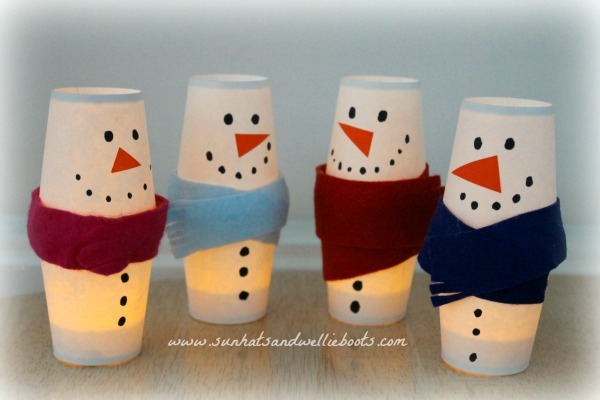 The weather may be turning cold but these Light Up Snowmen make great Winter warmers. 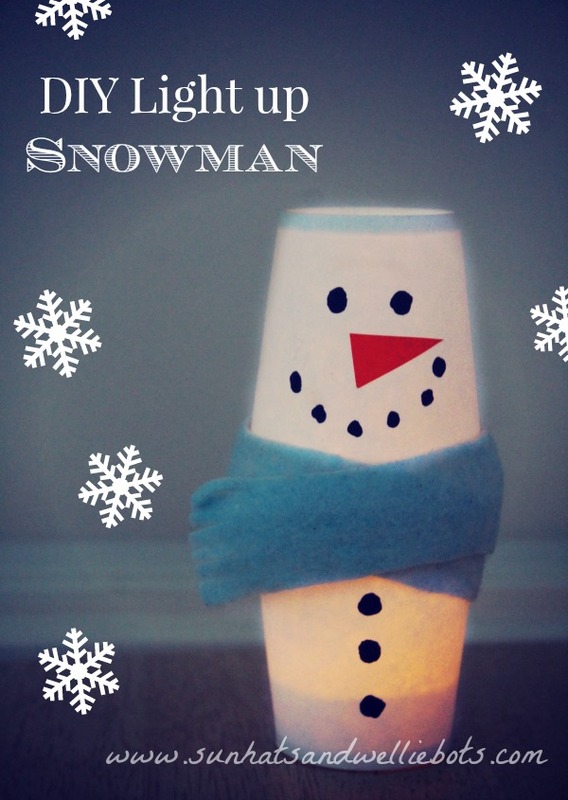 Made from upcycled items they're a thrifty activity for kids to make & will give your home a warm glow on those dark evenings. They're also a great way to use up those battery tealights left over from Christmas. 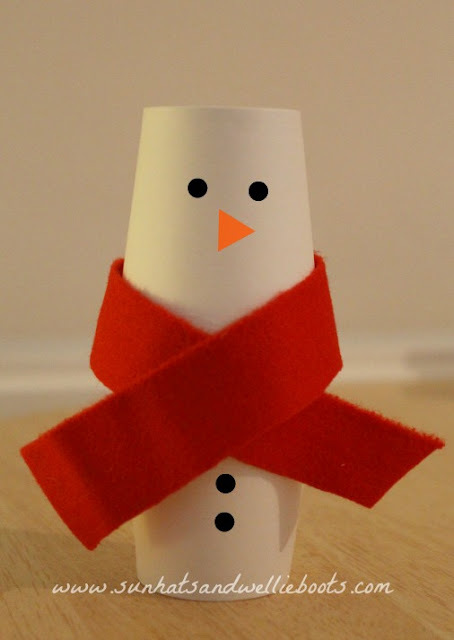 To make our snowmen lights we started off by sticking two paper cups together with sticky tape. You don't have to be too neat with this as the tape will be covered over later. 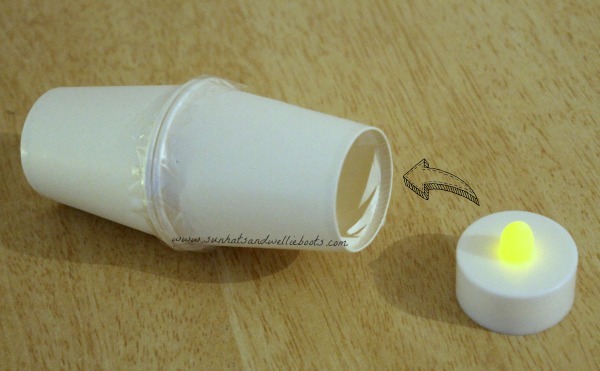 We carefully cut out a base from one of the cups & inserted a battery operated tealight. We used fairly small paper cups which meant the tealight fitted snugly into the base, but if you're using larger cups you might need to add a little tape over the base of the tealight to secure it. To make scarves for our snowmen we cut up some fabric remnants (mainly coloured felt) & attached to our snowmen using double sided tape. By wrapping the scarves around the cups we were also able to hide the sticky tape we used earlier. For the snowman's features we used Sharpie pens, & to create his carrot nose we cut triangular shapes from orange paper we found in an old magazine. After making one snowman light we thought it looked a little lonely so created a few more frosty friends to keep him company. When the tealights are lit the snowmen create a really warm glow & brighten up the corner of the room on a dark Winter evening. They also make great little night lights for little hands to hold. Minnie loves using one of these lights as she reads in bed at night. As they use battery tealights they can also be left on overnight & could be used to provide a little reassure to reluctant sleepers or to those who are unsure of the dark.